Home » Software Development » Blog » Installation of Software » How to Install Drupal 8? Great work guys! Now that you have read some things about Drupal and want to give it try yourself, here is a step by step guide to Install Drupal 8 and help you get started. As they say, starting is the toughest part. Drupal is a content management framework. Now you ask what’s that? So, a content management system manages the creation and modification of digital content. Drupal mainly focuses on web-based content such as website structuring and stuff. It is developed on top of the programming language PHP. It is open source, meaning that installing and running Drupal is free. So, let’s begin the installation. Before proceeding further, take out a moment to evaluate if your system has the necessary hardware and software for Drupal to function glitch-free. Disk Space – The core software requires 100 MB of free disk space. AMP stack requires slightly more than 1 GB. It is recommended to have at least 1 GB additional free space to accommodate your website resources. Memory – At least 100MB of free RAM available. 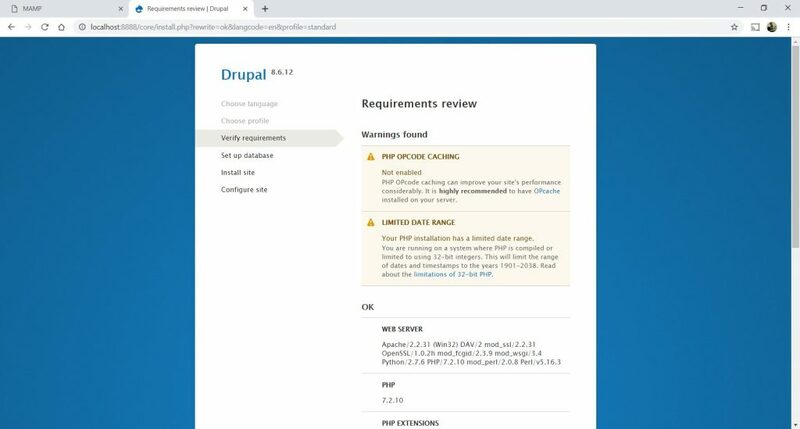 Now that we have established that your computer is fit to install Drupal 8, there are some other sets of requirements to begin developing your website in Drupal. This is popularly known as the AMP stack (Apache MySQL PHP). If your sole purpose now is learning Drupal, you can simply download the above three software and get started to install Drupal 8. 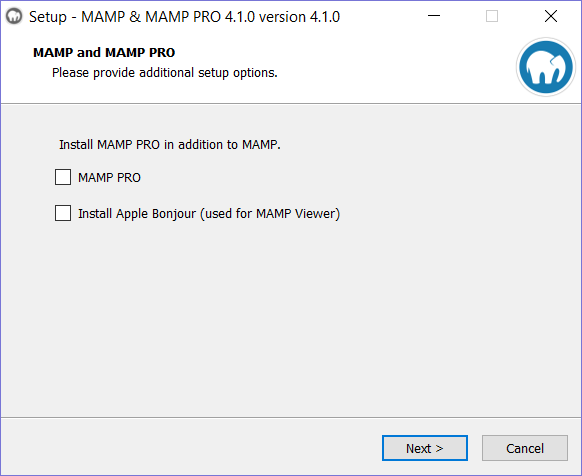 The detailed instructions are provided in the next section (Installing AMP) of this document. However, for a deeper understanding of various compatible software, read below. 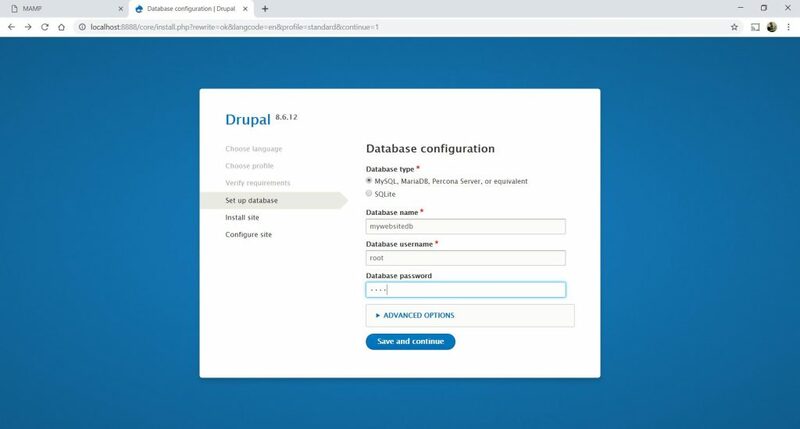 Drupal websites support connectivity with loads of data servers out there. You can host your data either on a local engine or a remote engine using any of the below-recommended database server providers. Although Drupal also supports MS SQL Server and MongoDB, it is highly recommended to use MySQL. The reason for this is that Drupal itself operated on MySQL database server and thus configuration becomes easy. Any other server requires additional database configuration. So, if you are a beginner to Drupal, it is advised to get a hold of Drupal on MySQL before experimenting with other databases. Apache is highly recommended as there is a vast community of Drupal users who have done development and deployment on Drupal+Apache combination. This makes resolution of common errors very easy. PHP built-in web server is included with the CLI when you install PHP. This is the most convenient method if you are just beginning to learn website development and hosting seems a daunting task to you. Do not use PHP web server for production environments though. Drupal runs on PHP. It is required for your computer to have installed PHP before you install Drupal 8. Drupal recommends PHP 7.2+ version. Since Drupal depends on a web and data stack for smooth functioning, it is very important to manage the dependencies amongst them. Any non-compatible software/tool downloaded can bring down the entire website. Drupal recommends using Composer to manage the dependencies. 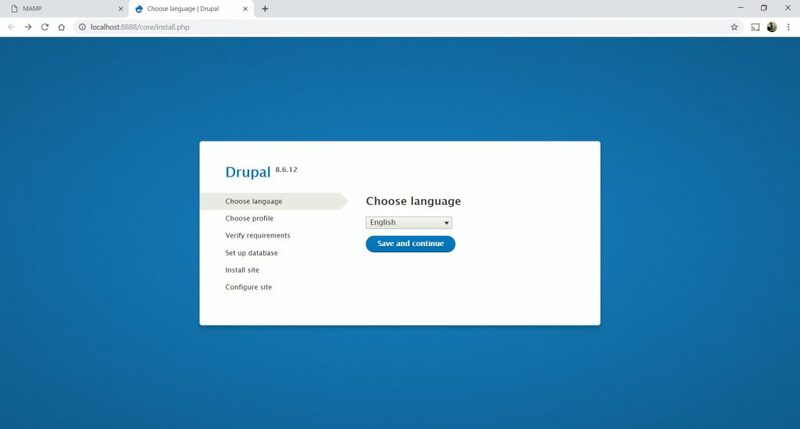 For beginners, who are aiming to learn Drupal with minimum hassles of hosting, server and other stuff, this section provides details on how to set up your local machine as the server and get started with Drupal development. 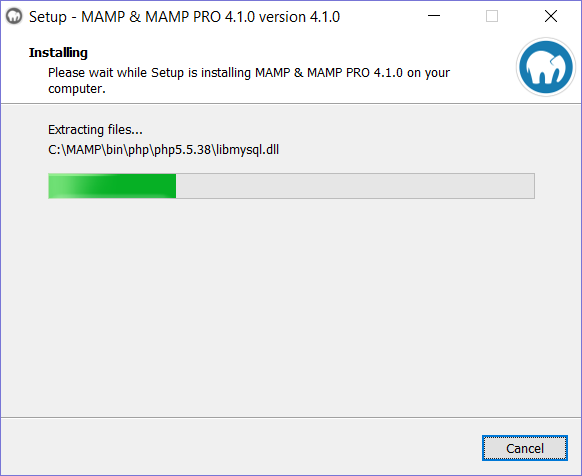 Step 1: Download AMP installer executable file. Step 2: Open the exe file. You will land on the following screen. You can select additional options if you want to. Click Next. 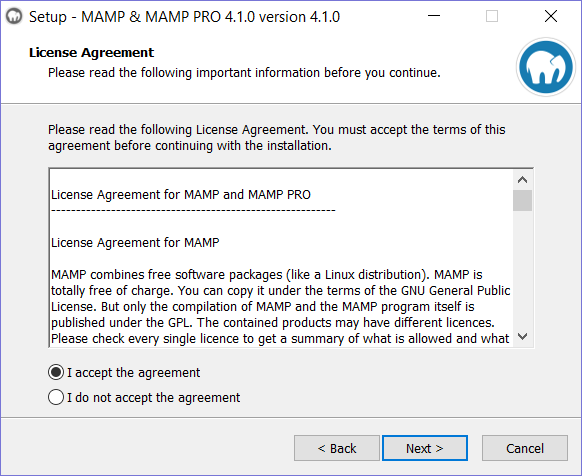 Step 3: Read and accept the license agreement. Click Next. Step 4: Select the desired directory to install and click Next. Step 5: You arrive on the start menu and desktop shortcut preference screens. Let them be the default and keep clicking Next until you arrive at the Install button. Click Install to begin the installation. Make sure you have an active internet connection throughout the installation process. Step 6: Click Finish to complete setup. 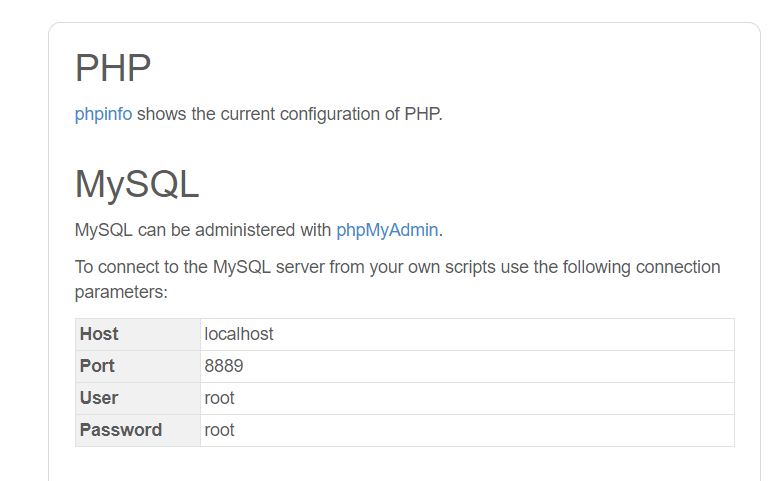 Now your local computer has Apache MySQL PHP installed. Great, we have all the ingredients required and are all set to install Drupal 8. 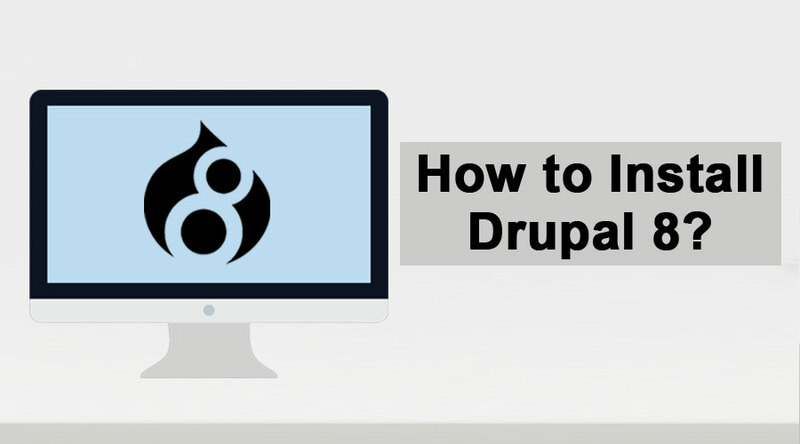 Let’s discuss several ways through which we can install Drupal 8. For Beginners, it is recommended to download through the installation file as it is the easiest way. You can just skip to the relevant sub-point below. However, if you wish to expand your knowledge base, read on below. 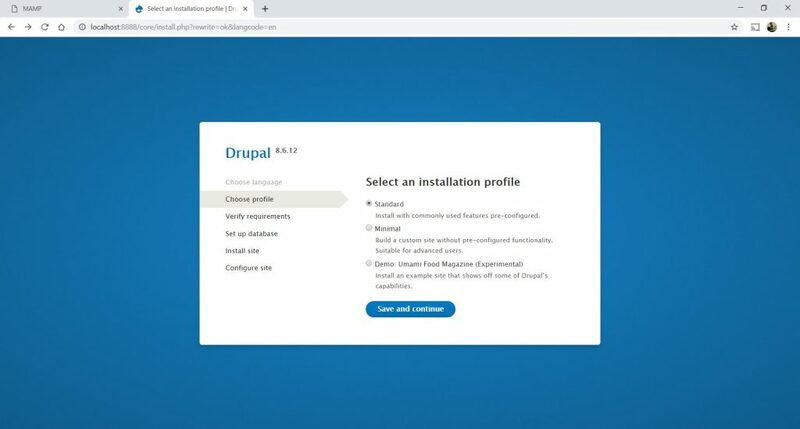 If you have opted to host your web server online through a web hosting provider site, look for a one-click Drupal installer. Get in touch with your hosting provider and ask them for a guide or documentation on one-click Drupal installer. There are pre-curated installation kits for various local development environments. You can simply find the best one suited for you here. Although it is unlikely that after having installed the AMP stack at the least, you would require this installation option. 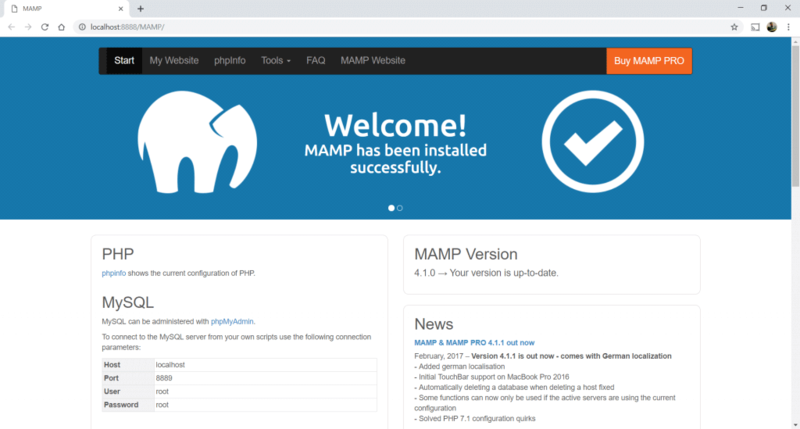 It is the highly recommended installation method as it would install the most compatible version of Drupal based on your underlying stack of PHP version, Web server, and Data server. Simply put, the composer will manage the dependencies efficiently. 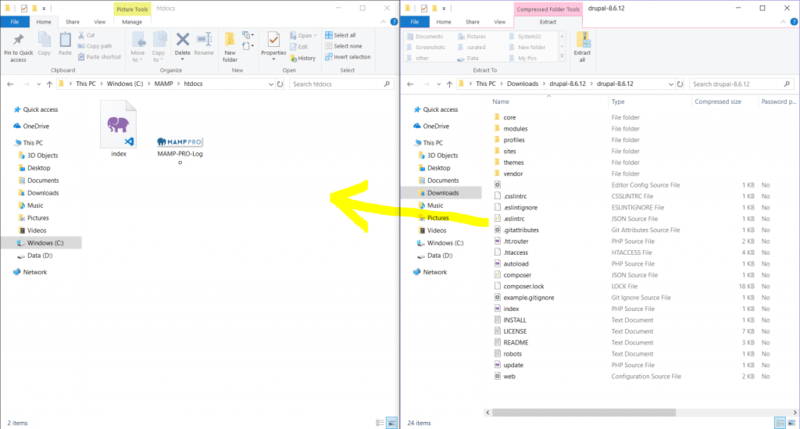 This will install the core files in a folder mydir in the desired location. Alternatively, you can also download an executable file from the Drupal website. This is the safest and hassle-free option for those who are at the beginner stage in learning Drupal. We will be covering this option step by step below. Step 1: Download the latest release zip or tar.gz file from Drupal. 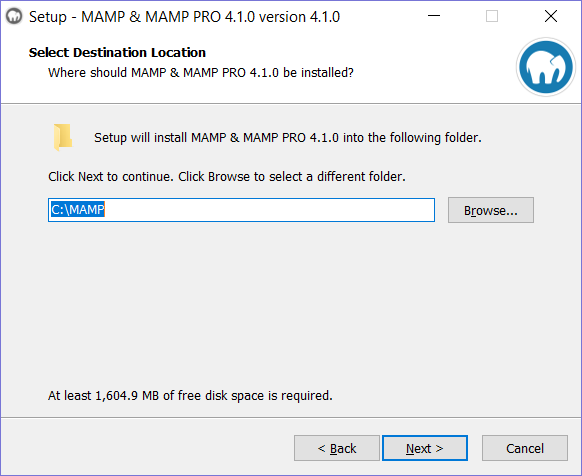 Step 2: Browse to the directory where MAMP was installed and replace the contents of the htdocs folder with the contents of the downloaded file. 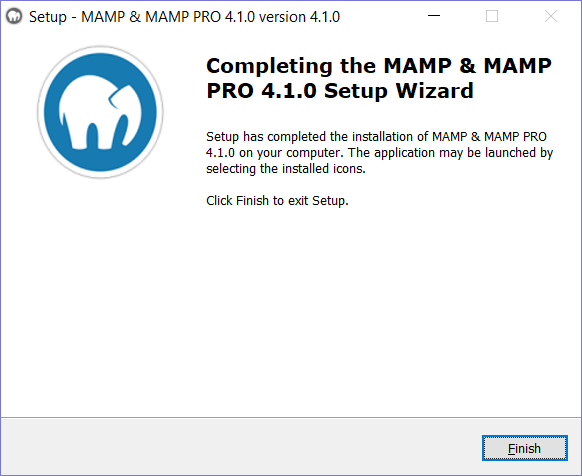 Step 3: Open MAMP and click on ‘Open WebStart page’. Make sure Apache and MySQL servers are running. Step 4: You will land on the following page. Step 5: Set up a database. 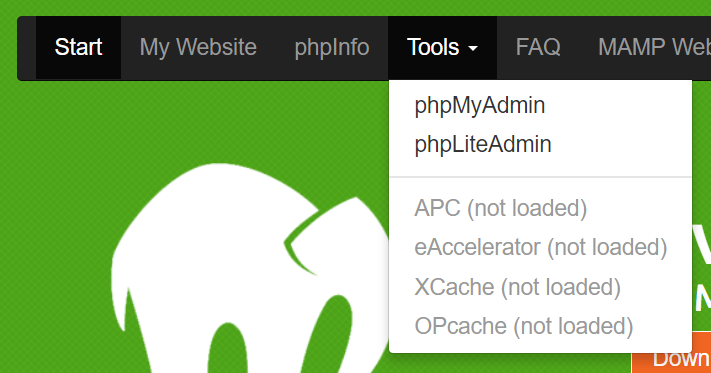 Click on phpMyAdmin. 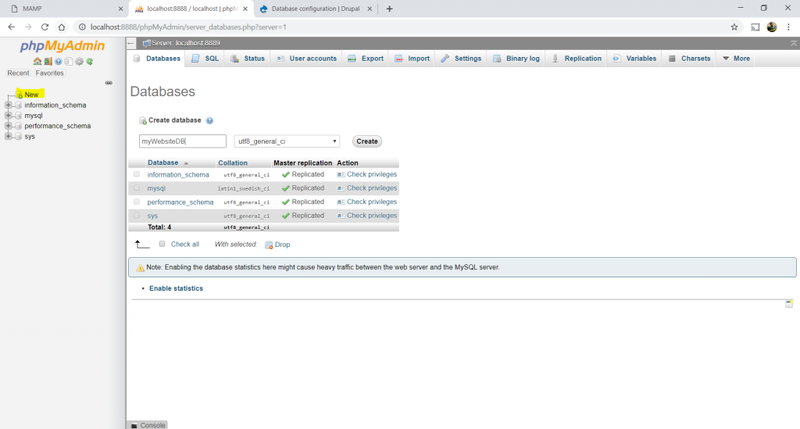 Step 6: This will open the PHP Admin page in a new tab. Click on New in the left panel and enter DB name. Click on create. 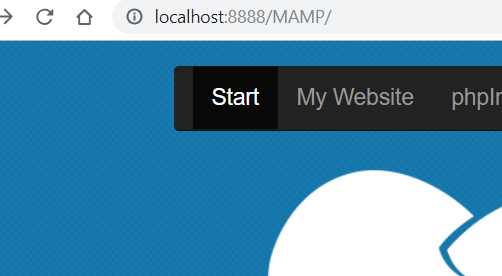 Step 7: Go back to MAMP tab and click on ‘MyWebsite’. Step 8: You will be taken to the Drupal default website installation page. Step 9: Click Save and Continue and select Standard Installation on the next screen. Click Save and Continue again. Step 10: If you arrive at such a screen, click ‘Continue Anyway’ link at the bottom of the page. Step 11: Enter the database name, username, and password. 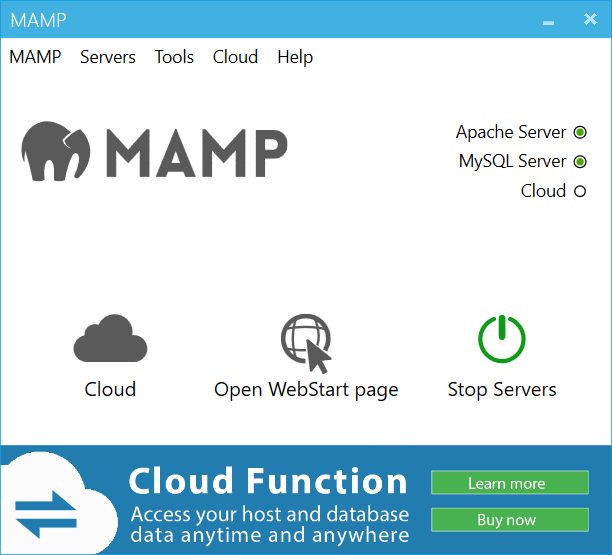 The username and password can be found in the MAMP landing page under MySQL section. Click Save and Continue. Step 12: Next enter your website name, select a username and password and click Install. Voila! Your first demo website is ready. Play around with it, give some little tweaks and learn Drupal in a fun way. If you are running a 32-bit machine, you won’t be able to enter dates before the year 1901 and after the year 2038. This is commonly known as the 2038 problem. Steps to Install SQL Server?